Paul Newton was commissioned by the ABC to paint this portrait in late 2006, just before Donald McDonald left his position as Chairman of the national broadcaster. McDonald is now Chief Censor at the Office of Film and Literature Classification. Prior to joining the ABC he had management positions at Opera Australia, Musica Viva and Sydney Theatre Company. They met at the ABC’s Sydney headquarters in Ultimo where Newton looked at a range of different compositions that would depict McDonald in his capacity as Chairman but also capture him authentically as a person. Born in Sydney in 1961, Newton is a well-known, much-commissioned portrait artist. After completing a Science degree at the University of Sydney, he did a Diploma of Art at the Julian Ashton Art School. This is his eighth time as an Archibald finalist. 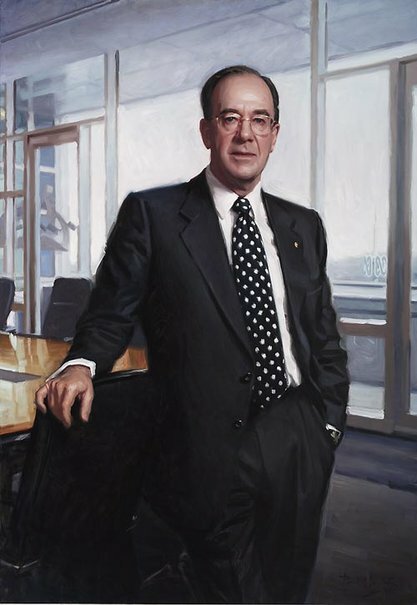 His portrait of businessman Pat Corrigan, which was hung in the 2006 Archibald Prize, was acquired by the National Portrait Gallery, where he also has portraits of David Campese and Imelda Roche. In 2001 he won the People’s Choice Award and the Packer’s Prize for his portrait of Roy and HG. He has twice been a finalist in the Doug Moran National Portrait Prize, and twice won First Place in the Portrait Society of America’s International portrait Competition.